TOKYO — Die-hard fans of Haruki Murakami, the Japanese author perennially pegged as a contender for the Nobel literature prize, flocked to bookstores on Thursday night to scoop up his new novel. Major bookstores hosted late-night events and stayed open through the early hours to celebrate the release at midnight (1500 GMT) of the hotly anticipated Killing Commendatore. 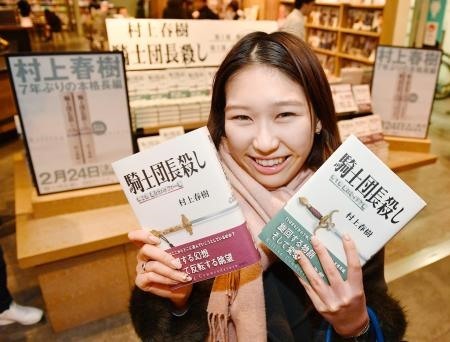 "I’ve been so excited about this book, I’m going to read as much as I can tonight, on the train home and as long as I can stay awake," said Taira Shibasaki, a young worker who was one of the first to get hold of the novel’s two volumes. During the countdown to midnight dozens of fans waited in single file outside the flagship branch of the Kinokuniya bookstore chain in Tokyo’s bustling Shinjuku neighbourhood. "I’m a big reader and I plan to read the book tonight so I can post what I think on Twitter," said Mohoko Aoyagi, a young female fan. "I’m sure there are lots of others who will do the same." Translated into some 40 languages, many of Murakami’s books conjure up a fantastical world where giant frogs challenge salarymen in battle and mackerel rain down from the sky. In others, the magic is replaced by realism. But details of his latest novel were kept under wraps before the launch, adding to the anticipation among Murakami’s devotees, known as Harukists. "The author told us he wants readers to discover it (the book) without knowing anything beforehand and that’s why we decided not to say anything until the publication. Even internally, very few people had access to it," a spokesman for the book’s publisher Shinchosha said. For years, international media, scholars and book lovers have listed the 68-year-old as a favourites for the Nobel, though the coveted prize has so far eluded him. Shinchosha has already printed a combined 1.3 million copies of the two-volume, 2000-page Japanese-language work in anticipation of brisk sales. No timetable for translations has been announced yet. "It’s a longer novel than Kafka on the Shore but shorter than IQ84 and it’s a very strange story," Murakami said of the book during a recent prize award in Denmark, according to his publicists. Public broadcaster NHK was set to air a programme two hours before the book’s release to discuss "the Haruki Murakami phenomenon". "The excitement of eager fans, the Harukists, is reaching a fevered pitch as they engage in guesswork about the book they have yet to see," NHK said earlier on its web site. Murakami became a global sensation with the publication of Norwegian Wood in 1987 and has written several bestsellers including 1Q84 and Kafka on the Shore. He is known to guard his privacy, rarely appearing in public, and has acquired a cult following for his intricately crafted tales of the absurdity and loneliness of modern life. The novelist peppers his work with references to pop culture.